Handmade baptism bombonieres for girl or boy, round cotton fabric with blue-pink or pink-yellow stripes, decorated with colorful plastic balloons and tied with blue and pink silk cords. The blue-pink color is well suited to twins christening boy and girl. The favors contain tulle with 6 sugar coated almonds of the company Hatzigiannakis. 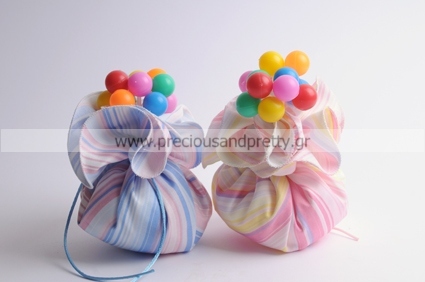 https://www.preciousandpretty.com/2012/04/baptism-favors-girl-ballons.html Greek Wedding Favors|Orthodox Crowns|Stefana|Baptism Invitations Handmade baptism bombonieres decorated with balloons B29 Handmade baptism bombonieres decorated with balloons B29 by Greek Wedding Favors|Orthodox Crowns|Stefana|Baptism Invitations Product #: Greek Wedding Favors|Orthodox Crowns|Stefana|Baptism Invitations_7263432926139439843 5 stars out of 5 reviews.